The buzzing grew louder as the helicopter with a wall of wind made its way toward us, moving one tree after another until we were enveloped in its power. A 40-foot long steel cable trailed behind the helicopter and attached to it, a massive log twice the length of a car. I’d never been on a tour of an active river restoration site – let alone one where you instinctively duck down as logs fly above you, or where you hike through 15-foot-wide excavated side channels near a river. This is the type of restoration work that The Freshwater Trust (TFT) and the Sandy Basin Partners have been doing for more than a decade in the Upper Sandy Basin near the foothills of Mt. Hood. 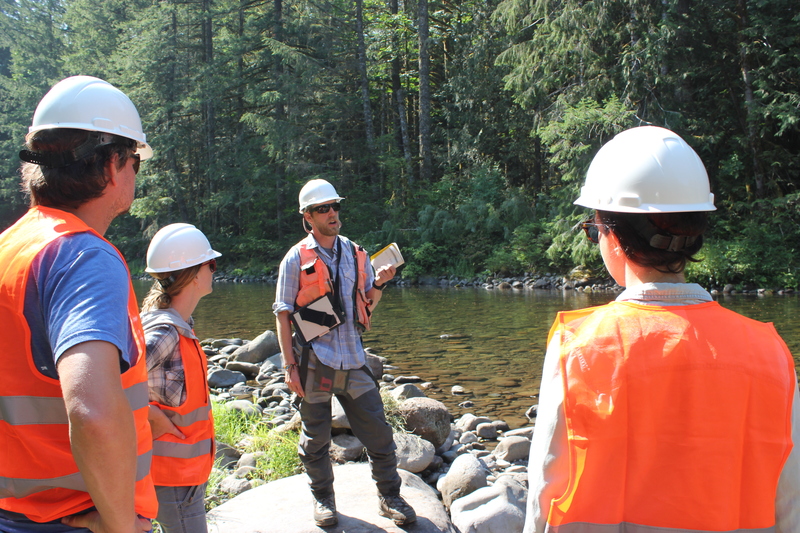 I and other members of the Headwaters Council, the young leaders board of TFT, were moving quickly through the thick underbrush along the Salmon River, chasing the helicopter upstream to where the work was happening. 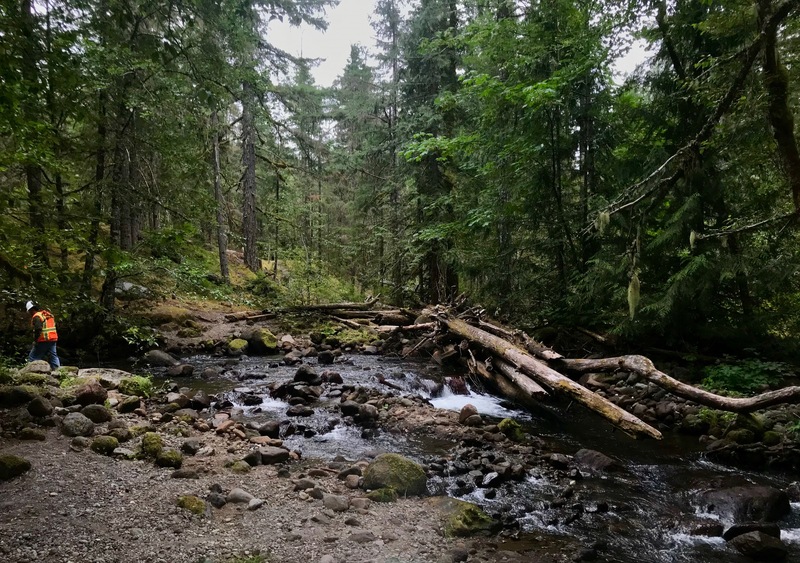 The Salmon is a tributary of the Sandy and a classic Pacific Northwest river – old growth lining its banks, and thanks to TFT, Pacific salmon species swimming under large wood structures that have been built along its length over the past 10 years. The Sandy is Portland’s backyard playground and the source of drinking water for hundreds of thousands. Working in corporate sustainability for the Craft Brew Alliance, my mind immediately goes to the fact that the Sandy is where we get our water to brew the beer for which this region is known. Yet, as I heard on the tour, the basin has seen some man-made changes over the decades that have impacted habitat and the health of the rivers, ones TFT has worked hard to reverse. Where the large wood has been taken out of key places, for fear of flooding, they’re putting it back. That’s where the large wood flying through the air comes in. That’s the fastest way they can build these log jams that were once characteristic of the area, and important for the health of the river system. We began that day by looking at one section of the Salmon, fast and straight without anything standing in its way. The way I thought a healthy river might look. It’s how most of them do. In fact, when there’s wood in rivers, we often think it looks messy and going to contribute to flooding, be an impediment to kayakers or a mess with fly-fishing. TFT gave me the opportunity to rethink that assumption. As our group finally made its way down to the site where the helicopter was delivering its loads of logs, we were greeted by Jeff Fisher, the habitat monitoring coordinator at TFT, who has hiked the entire length of the Salmon River, documenting every bend, shallow spot and side channel. He collects the data that ensures the projects are indeed having the intended impacts year over year. I asked how long it would take for us to come back to see the work finished. Months? Years? Six weeks. The window for this work is short in order to reduce impacts on fish. Come Fall, I’ll be able to walk back to these spots and see fish visiting their newly built homes in habitat that had been cut off for more than 60 years. Over the course of three days, TFT and Columbia Helicopters would transport and place more than 900 pieces of large wood across multiple project sites, miles apart. Excavators will then move in to finalize the placement, securing the structures to withstand the harshest high-flow events. Side channels will be reopened for habitat. By Fall, I’m told you’ll be able to see juvenile Chinook and steelhead rearing in its safe waters while adult salmon kick their tails and spawn in fresh gravel beds. Every one of these restoration actions is the result of years of planning, gathering data and implementing precise engineering solutions to create the most environmental benefit possible. No single log is placed without a plan. 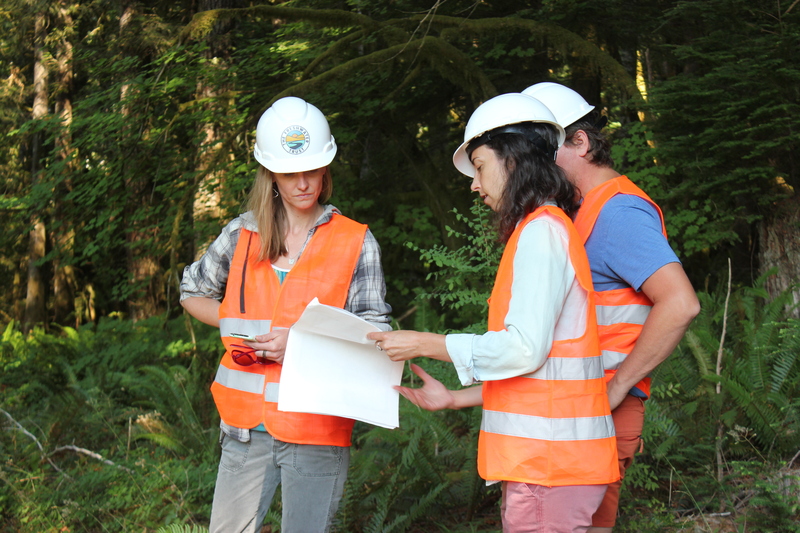 Going out on a tour of a project site with TFT was unlike anything else I have done with a non-profit. The experience itself was energizing and provided the opportunity to see the actual, on-the-ground ways this group is making a difference for real rivers, ones that we all rely on. I’m looking forward to heading back in the Fall and seeing those fish for myself. I will never look at a river the same way again. Julia Person is the Corporate Sustainability Manager for Craft Brew Alliance and a member of The Headwaters Council for The Freshwater Trust. She comes from a background submerged in data and analytics, having worked as a contract Geographic Information Systems Analyst, and is well versed in supporting sustainability initiatives in the public and private sector.